Think dire wolves are a hundred percent fictional? You know nothing, Jon Snow. George R.R. Martin may have an epic imagination, but he didn’t completely make up these Game of Thrones creatures. The powerful canines that we now call “dire wolves” (Canis dirus) did, in fact, patrol North America during Earth’s last ice age. And though they would have been dwarfed by their counterparts in Westeros, the prehistoric predators were still formidable enough to scare the crud out of any Lannister. 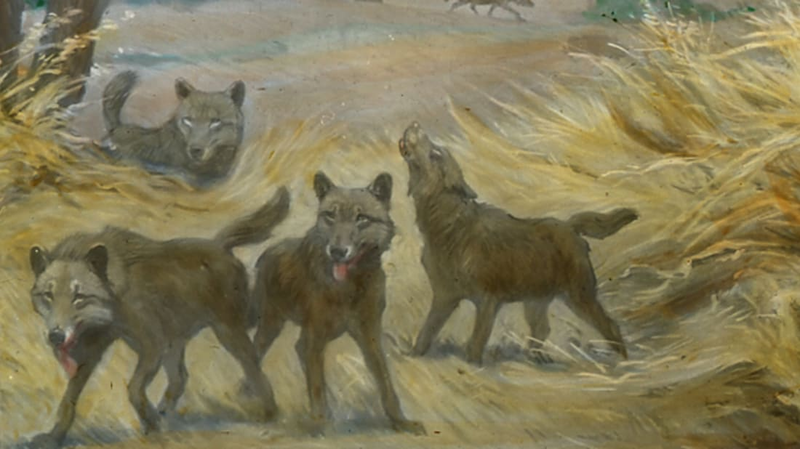 As the cliché goes, dire wolves weren’t fat—just big-boned. Despite being about the same length as the gray wolf, C. dirus exceeded its modern cousin (Canis lupus) in weight by roughly 25 percent, which means members of the extinct species weighed somewhere between 125 and 175 pounds. Dire wolf bones were broader overall and connected to large, enviable muscles. On the downside, the stocky C. dirus probably wasn't super-speedy, as evidenced by its proportionately shorter legs. 2. … And Their Bites Were More Powerful, Too. Paleontologist François Therrien calculated that dire wolves could chomp down with 129 percent of the force available to their 21st-century cousins. Yet, in his view, the jaws of another long-extinct carnivore would have made both of them look relatively toothless. Therrien estimates that even the most forceful dire wolf bite was only 69 percent as strong as those inflicted by the American lion (Panthera atrox), which disappeared 11,000 years ago. 3. Dire Wolves Had a Taste for Horses. These hoofed mammals formed the bulk of a dire wolf’s diet, as revealed by tooth analyses. But bison, mastodons, ancient camels, and giant ground sloths were also available, if the wolves felt like shaking things up a bit. 4. SoCal’s La Brea Tar Pits are a Dire Wolf Gold Mine. Forget Winterfell: If you want to see some dire wolves, head to southern California. An awesome display case inside the Page Museum at the La Brea tar pits houses nearly 400 Canis dirus skulls. And that’s just the tip of the iceberg—so far, the pits themselves have yielded more 200,000 individual dire wolf specimens. How did so many end up dying in the same place? Skip ahead to our next item. 5. Dire Wolves Coexisted with Saber-Toothed Cats. Few prehistoric creatures are more iconic than the magnificent beast known scientifically as Smilodon fatalis. (Just so we're clear, those huge felines were not actually tigers.) After dire wolves, saber-toothed cats are the second most commonly-found mammal at the La Brea tar pits, where thousands of their bones have been discovered. In total, around 90 percent of La Brea’s mammalian fossils belonged to carnivores of some kind. That’s because, for several millennia, these pits functioned as a predator trap. The process was fairly straightforward: When an herbivore would get stuck in the tar, hungry meat-eaters would come running, only to suffer an identical fate. As the corpses piled up, more and more carnivores were lured over, resulting in a local fossil record that disproportionately represents their population. 6. By Canine Standards, Dire Wolves Weren’t Especially Bright. Dire wolves may have been stronger, but, by virtue of having bigger brain cases, grey wolves are likely smarter. 7. The Species Roamed from Canada to Bolivia. Before they vanished 10,000 years ago, C. dirus must have been a common sight in the Western hemisphere. 8. Some Scientists Think They Originally Evolved in South America. There’s been some debate as to which continent first gave rise to the dire wolf. While most paleontologists think the creature evolved on North American soil and spread southward, the opposite scenario is also possible. But because remains are much more common above the equator, and fossils from a probable ancestor named Canis armbusteri are found exclusively within U.S. borders, the first theory is far more popular. 9. Specimens from 12,000 Years Ago Broke Fewer Teeth than Those from 15,000 Years Ago. When competition dries up, the pickings get better. It’s been suggested that dire wolves had to contend with more rival predators 15,000 years ago than they did later on. This forced them to scavenge carcasses that had already been stripped of the good stuff whenever other hunters drove off their live prey. Because bone-gnawing after meals can really take a toll on one’s teeth, C. dirus back then suffered from widespread dental woes. But theoretically, as their competitors started dying off, the dire wolves were left with more kills, meatier corpses, and healthier chompers. 10. One Organization is Trying to Breed Faux Dire Wolves.